ATTENTION VETERANS: Lower your monthly mortgage payment WITHOUT the hassles of a full refinance! This Streamline refinance, or Interest Rate Reduction Refinance Loan (IRRRL), is one of the best options for homeowners who already have a VA Loan and who want to reduce their monthly payments by refinancing to a lower interest rate. This refinance type is relatively easy and can be completed quickly, due to the fact that homeowners are refinancing from one VA Loan product to another. With this type of refinance, there are several prominent advantages, including no required appraisal in most cases and little to no out-of-pocket costs in most cases. Because the lowest rate is what you want to get, using a wholesale mortgage lender and NOT your bank or a direct lender is most likely your best bet. Having access to wholesale mortgage rates should get you the lowest possible interest rate. An IRRRL may be done with “no money out of pocket” by including all costs in the new loan or by making the new loan at an interest rate slightly higher to enable the lender to pay your closing costs from loan rebates. The occupancy requirement for an IRRRL is different from other VA loans. For an IRRRL you need only certify that you previously occupied the home meaning that home may be a 2nd home or investment property now. Getting started on a streamline refinance is easy and the whole process can be completed in a surprisingly short amount of time. 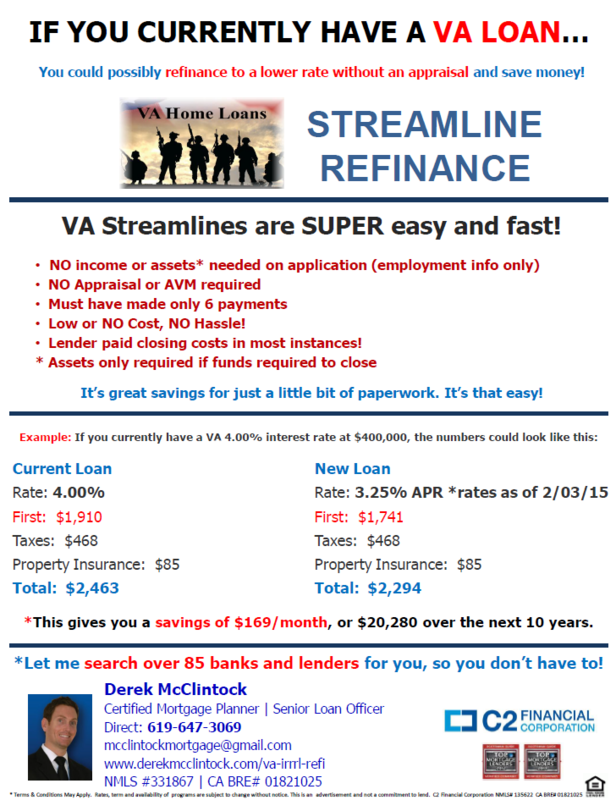 Call or email Derek today to get your free VA IRRRL refinance quote. It only takes a couple minutes to potentially save tens of thousands of dollars!